A year ago I applied for the ARThink Southasia fellowship programme. A unique arts management programme open to cultural practitioners from 8 different countries, the objective of the initiative is to build competencies and networks that will benefit the cultural sector in the region. At Kahani Designworks we’re very passionate about working with museums, galleries and theatre groups and it has been important to gain a better understanding of this sector, so I was delighted to be selected a fellow for the 2013-14 programme. Residential Course: The focus on the fellowship has been to study the ways in which the creative industries such as design can serve the needs of cultural practitioners in India. I believe that if they work together, they can foster a creative culture in India that thrives on innovation and encourages creativity. But for this to happen, it is important to secure the role of the arts in everyday life and unfortunately, the arts are rarely in a confident and secure position in India. Over the two week course, my question really became: can there be a way to bring design thinking to the way we engage with the arts? When our marketing mentor on the fellowship, Prof. Dennis Rich said this, I realised that one of the most effective ways to contribute to the arts is through better communication design. 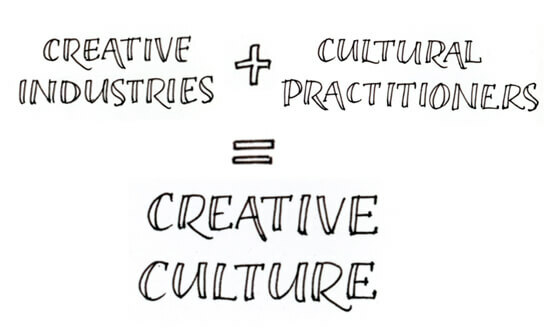 Whether for the purpose of brand positioning, marketing, policy or outreach, clear, efficient communication that makes the work of arts organisations and institutions accessible to a wider audience is the first step to building a strong foundation for a creative culture. What we needed then to do at Kahani Designworks was to look at how to formulate communication strategies and design processes that could work in the very specific context of cultural organisations. The Secondment: As phase two of the programme, I’ve just completed a month long study trip across Germany. I have visited over 30 museums, exhibition centres and art spaces of every space and size. I’ve had the opportunity to speak to leaders in the cultural sector: people who are responsible for commissioning design, designers and communications experts. These generous people lent me their time and patience, telling me of their experiences. 1. The design process is constant. The process of crafting communication remains the same, no matter whom you do it for: a corporate company, an arts institution or an individual. What does change however, is the context for which you create that communication. Every kind of organisation needs to talk about its activity, share its expertise and promote its offering, but not every organisation does so for the same reasons: companies need to sell their products or services but institutions and art centres serve communities. Their mandates are different, their audiences are different and the ways in which they need to communicate are different. What is not different, is the design process to create those communication strategies. Concepts such as ‘branding’, ‘audience engagement’ and ‘marketing’ are considered the domain of business-speak. To many cultural practitioners, they sound intimidating and I’ve even heard outright aversion to these words. This is partly because of their association with the motivation of making profit. There is however, a lot to be learned from how these concepts work because they employ effective methods to make every communication message go further. If you’re a non-profit arts group, making your message work hard for you is a very important consideration in a sector that needs to make the most of limited resources. And if someone else has already done the legwork to figure out how to communicate better, why not take a leaf out of their book? I was asked a question once, that if is everyone is creative, what makes designers so special. My answer to this would be that designers have the unique ability to be both big picture thinkers, as well as detail oriented craftspeople. It is in the nature of a communication designer to think of not just communication strategy, but its users, its components and the interactions between them. Contrary to the notion of the self-important designer, this example proves that the design process can enable people to make or find their own solutions. When you enable others to be a part of the design process, the ownership and responsibility towards the solution is shared. In this case, the exhibition is a shared outcome that has been enabled by a designer. Can we consider more design problems in this way? How can we empower the visitors at an art museum to influence programming in a positive, co-creative way? 3. Design is also culture. At times, I think we designers get caught up in the notion of design being a service that we tend to overlook the broader meaning of our work. Whether we’re working for industry, arts or society, the things we produce contribute to visual and material culture around us. This idea breaks down the conventional client-consultant relationship and sets up a dialogue instead. More importantly, it examines how design can be more than just a service and become a way of conversing with the keepers and makers of culture. If designers too are cultural producers, then we should take more pride – and responsibility – in what we create. I know that for us at Kahani, it’s made us question how to work more closely with cultural institutions, rather than for them. 4. Design is an investment. More often than not, when the question of hiring a design team arises for the arts, the fear in everyone’s minds is for the fact that there is “no budget for it”. While on the one hand it speaks of the general perception that design is a prohibitive expense, it also speaks of two facts: firstly, that they don’t budget for design in the first place and; that non-profit organisations do not look at design as an investment. In Germany where I encountered many professionally managed arts organisations, it was clear that they take communication and design very seriously. From functional signage and expressive brochures to informative websites that are the first point of interaction for a potential visitor – these institutions have made an effort to be consistent and helpful. Design has a clear place in these visitor journeys. A positive experience brings a visitor through the doors the first time, gives her reason to return and eventually makes an advocate out of her. A well-designed website means that when she tells someone about a museum or theatre company, that person has a reliable source of information about what it does and why its work is relevant. Some of the most positive experiences I had in German museums were at the Museum für Kunst und Gewerbe in Hamburg, the Museum für Moderne Kunst in Frankfurt and the Berlinische Galerie in Berlin. I could tell you more, but their websites really DO do the talking. 5. The arts are part of a greater ecology. Drawing, painting, sculpture, and theatre – these disciplines are the origins of architecture, design, fashion and film – things that touch our everyday lives. Whether we are aware of their influence or not, the arts inform the way we live, communicate and the way we find our place in society. We derive our cultural identity from the arts. At the same time, artists must be aware that the arts are a part of a greater ecology. The arts must become more transparently managed and responsive to social needs while contributing to the activities that keep an economy vibrant. This may mean that artists have to work with people that bring professionalism to their work, or themselves invest in learning best practices. Whether it’s doing the audience studies to show the impact of artistic work, educational programmes that work with local communities or publishing accounts – there are many ways for artists and arts organisations to be responsible towards the environment that supports them. Communicating intentions, achievements and outcomes, is critical at every step of the way. Since I’ve been interested in this idea of creative economies, I spoke to Andreas Lübbers is one of the leading figures of Hamburg Hoch 11 – a professional body that represents 11 creative disciplines in the Hamburg area. A strong proponent of responsible cultural practices, he believes that society and the creative community need to be accountable to each other. Back in India now after the fellowship, I’m very keen to put some of these insights into our everyday practice at the studio. At the same time, this experience will continue to influence the len through which I filter my thoughts on art, design and culture in India. For this, I’m glad for the opportunities that Perch provides, and hope that you, our readers, will continue being a part of our discussions on the role of design in everyday life. Many thanks to the team at ARThink Southasia, Goethe Institut, British Council and my fellow colleagues foe enabling this journey.